The “iron” theme is carried out throughout the inn. The International Motorcycle Show is coming to Minneapolis next weekend. Can spring be far behind? Last weekend, I had the opportunity to attend a concert in Lanesboro, Minnesota, and decided to book a stay at Iron Horse Inn and Outfitters. 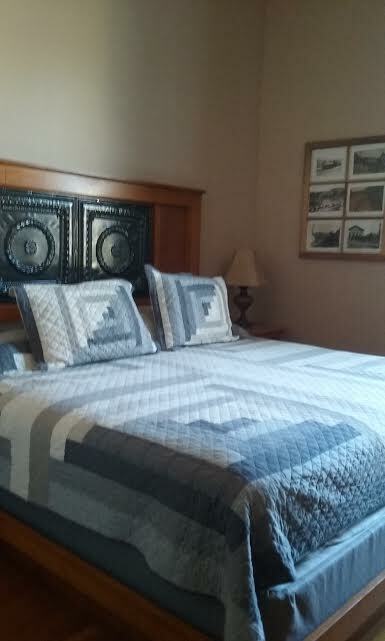 The Iron Horse is the newest place to stay in what is known as the “bed and breakfast capital of Minnesota”. A nod to Lanesboro’s railroading past, it’s specifically geared to motorcyclists. Downstairs, Pat Shanahan has filled his old storefront on the corner of Coffee Street and Parkway Avenue with custom bikes and motorclothes. Upstairs, he’s built a beautiful four-bedroom inn. Each room has a comfy king-size bed, a shower, flat-screen TV, mini fridge and microwave. One room also features a loft. A large room facing the corner is the Gathering Place, where groups can chill out after a long ride. There’s a coffee maker and a big refrigerator where you can store your beer. Just down the hall, there’s a washer and dryer. Biker nirvana! In keeping with the “iron horse” theme, the walls are decorated with old railroad photos. The handles on the kitchen cupboards are made from old railroad spikes, and pressed tin ceiling tiles have been used to decorate the headboards. The Gathering Place at Iron Horse Inn & Outfitters, Lanesboro, MN. If you’re out riding Minnesota this summer, visit Lanesboro. 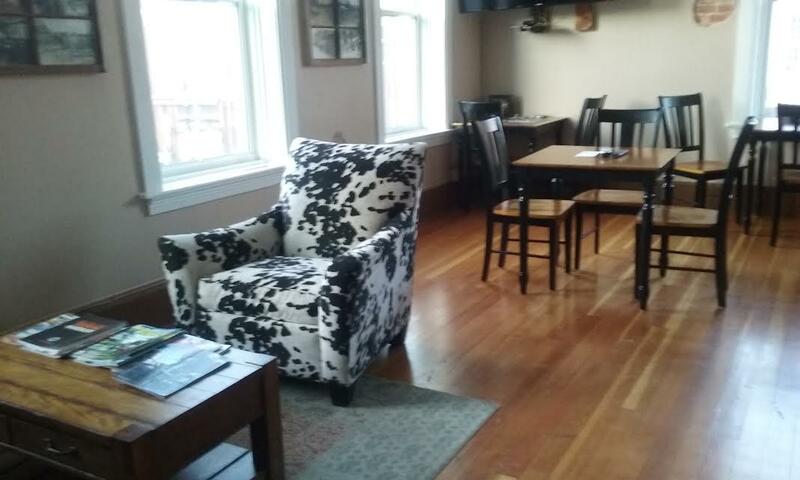 If you’d like to stay at the Iron Horse, book well in advance. Lanesboro, about 45 minutes south of Rochester, is one busy little town! The headline in yesterday’s Minneapolis Star Tribune says it all: “Indian Motorcycle shifts into overdrive as spring nears.” Polaris isn’t the only one shifting gears. As Minnesota weather continues to stay in the deep freeze, there are signs of spring in the motorcycle world. I’m getting more and more emails for motorcycle gear. And last week, the editor Thunder Press called to ask for a high-resolution photo of the cover of Ride Minnesota. He’s publishing a review in the March issue. The tabloid reaches around 70,000 Harley Davidson owners, so I’m looking for a boost in sales. A couple of weeks ago, Ralph and I attended the International Motorcycle Show at the Minneapolis Convention Center. While Ralph sniffed around the new motorcycles, particularly the Indians and the Victories, I handed out book marks with a photo of the book cover on it and the words, “Available from Amazon.com and BarnesandNoble.com.” I’ve seen a slight uptick in sales on Amazon since then. It’s time for me to shift into gear, too, and start promoting spring sales of Ride Minnesota. And to start writing another book, about our Lake Superior Circle Tour.